By the fifth day of the typhoon, the rain battered the hotel’s windows a little less loudly. The sheets of water pouring through the ceiling tiles diminished to a drizzle. We studied our old pairs of sneakers and decided they could be sacrificed; then we put them on, and waded out into the ancient Vietnamese capitol of Hue. The people stranded on rooftops had begun to climb down and take stock of the flood damage. In the open-air market, vendors stood in waist-high water, weighing eggs and fruit. The more enterprising locals offered journalists a glimpse of corpses pulled from the river for a few bucks a head. We had seen nothing of the city since our arrival earlier that week. Cut off from the world by the worst flooding along the South China Sea coast in nearly a century, we later learned that 1500 people had died and 22,000 were homeless. From our vantage point in the Century hotel, where we played endless games of Hearts and ate rice steamed in rainwater, the typhoon was equal parts monotony and adventure. We had no power but candlelight, no running water but the downspouts, where the less squeamish stood daily in search of a natural shower. The appearance of sampans filled with refugees happy to camp on the hotel floor was sharply sobering; but mostly we wanted to know: When will we get out? And how? There was no news, no weather report, and when we asked for typhoon updates from the hotel staff, they stared at us as though we were mad. Vietnam, as it happens, has no national weather service. I had come to Southeast Asia in that monsoon season—October, 1999—in search of a legend: Jim Thompson `28, born to privilege in Delaware, schooled at St. Paul’s, a Brahmin socialite in pre-war New York, trained by the OSS to liberate Thailand from the Japanese during World War II. The man with the slick blond hair and the piercing gaze had been airborne over Bangkok in August 1945, when word spread through the jump plane that Japan had surrendered. He arrived in Thailand as a victor, and never really left. In the ensuing twenty-two years Thompson made a name for himself in ways he could not entirely control. He bought a share in the venerable Oriental Hotel, a storied palace on the banks of Bangkok’s Chao Phraya, and despite squabbling with the other owners, lived there obstinately for over a year. 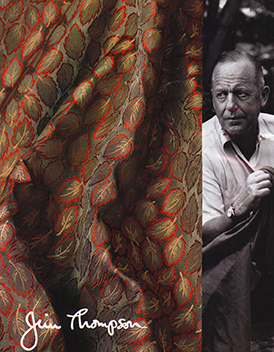 He revived the moribund practice of hand-weaving Thai silk and marketed the fabric worldwide—his company, Jim Thompson Silk, is a design industry force to this day. Schooled as an architect, he assembled a compound of traditional Thai structures on the banks of a Bangkok khlong and filled it with an unsurpassed collection of Southeast Asian ceramics, sculpture, and artifacts—a passion that drew the anger and opposition of the Thai government. He entertained sumptuously, six or seven nights a week, and anybody who aspired to significance angled for an invite to Thompson’s house. Then, on Easter Sunday 1967, he walked down a driveway in Malaysia and disappeared without a trace. He left his cigarettes and his lighter behind. Neither his body nor his fate has ever been found. Thompson’s story haunted me for years. It is, after all, a compelling one—and I have made a living from good stories. But beyond the force of the tale was a curious sense of connection: I, too, had a Princeton education; and I had been trained in espionage by the OSS’s successor, the CIA. Thompson did his jungle combat training in Ceylon, while I did mine in the heart of southern Virginia. I discovered, to my surprise, that Thompson’s great-nephew lived in my own town of Evergreen, Colorado. Nearly sixty years separated us, but we had walked along similar paths. I knew that someday those paths would cross, and I would find myself in Southeast Asia, following Jim Thompson’s trail. I started my research with the sole biography of merit. In 1970, William Warren, a friend and fellow expatriate of Thompson’s, published The Legendary American: The Remarkable Career and Strange Disappearance of Jim Thompson. It’s a well-crafted study that manages to bring Thompson’s personality and routines to life, despite the fact that most readers are probably more interested in his sensational end. Warren’s account has a tantalizing quality, however: he mentions intriguing facts without attempting to interpret them for the reader. I later discovered that this is common practice among those who knew Thompson, or guessed at the culmination of his life. Old Bangkok hands hesitate to say too much. Knowledge, they told me, can be mortally dangerous. According to Warren, Thompson began life in post-war Bangkok as intelligence chief for the OSS, and cultivated a circle of Laotian and Cambodian friends drawn from the revolutionary intelligentsia of both countries. He made frequent visits to Khorat, a desolate region of northeast Thailand known for dust, penury, and its largely Laotian ethnic population. Several of Thompson’s Thai friends were executed for treason after a failed uprising, and his personal assistant—a Laotian—was forced to flee the country. Khorat later became the staging ground for the U.S. Air Force’s overflights of Cambodia during the Vietnam War, under the command of Thompson’s former OSS leader. Finally, the year Thompson disappeared—1967—was the height of American conflict in Southeast Asia. His life, as I saw it, embodied the arc of U.S. intelligence activity in the years following the Good Fight: from the defense of freedom to the morass of the rice paddies. Thompson is believed to have quit espionage entirely around 1948 in order to become a silk trader. 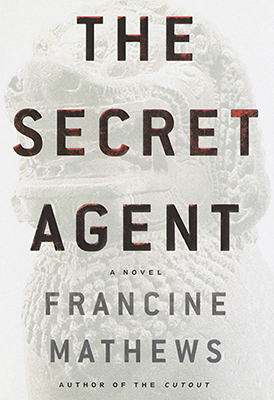 But when I looked at the map of Thailand—and later visited Khorat myself—I guessed that he’d journeyed into the hinterland so often in those early Thai years in order to run agents for U.S. intelligence. By 1949, the communist Mao Zedong was triumphing to the north and the colonial wars of Cambodia, Vietnam and Laos were just heating up. Revolt was everywhere, and revolt was of concern to Washington. To shroud his covert activities from scrutiny in Bangkok, particularly after the authoritarian coup of 1947, Thompson needed a plausible cover job. One of the few things the dust of Khorat will grow is mulberry trees. Mulberry trees feed silk worms. And to Jim Thompson’s delight, silk was a product he could promote the world over. I called my contact on the CIA’s Publications Review Board a few months before I left for Thailand. As a former employee, I’m required to vet my manuscripts with the Agency, to ensure I don’t publish anything classified. When I once casually referred to this process as censorship, my contact chided me gently. He had, after all, required me to delete only one word from my previous spy novel, The Cutout. I was curious how the Agency would react. In some circles there is a firm belief that Thompson was killed by the CIA, for dark and inexplicable reasons embedded in espionage’s culture of betrayal. Jim Thompson: the man who knew too much. Would they ask me to give the topic a wide berth? Would they slap some sort of legal injunction on me? We flew into Bangkok, my husband Mark and I, and left immediately for Khorat, where the old VFW dining hall still exists thirty years after the end of the war in Vietnam. The arid region surrounding the city is notable for its ancient Khmer ruins, which date from the thirteenth century and offer a visual quotation of Angkor Wat. We climbed through the tumbled masonry and ran our fingers over the hooded heads of stone cobras; and then, persuading our driver that we had no interest in buying the ubiquitous pottery, traveled overland in search of silk weavers. They were everywhere, as it turned out: a cottage industry of foot-driven shuttle looms hung with shimmering strands of raw silk. The old wooden structures are crammed into warehouse-sized rooms, a few square yards per weaver, but the pace of production is hardly staggering—the weavers choose when they work, and most weren’t bothering the day we wandered in. We found dyeing vats and spools for drying; the massive cauldrons where the silk worms are boiled out of their cocoons; and skein upon skein of brilliantly colored silk thread. For a moment, gazing at the vivid swirls, I understood what many observers of Jim Thompson describe as his obsession with the stuff—his uncanny knowledge and sense of color, his ability to charm a fabric onto the back of a customer. One anecdote has Thompson leaving a dinner party in his host’s bathrobe, having given away his own silk suit that evening. I found it hard to believe that anyone could fail to notice Ankana Gilwee, who sat across from me pouring out tea in the Authors Lounge at the Oriental Hotel. She was a small-boned woman, breathlessly chic, with an air of having lived in Paris. The silk scarf she wore today was flung artlessly over one shoulder, her dress flirted charmingly with her knees. She must be in her high seventies, but with Ankana, age was irrelevant. I had written to the Oriental Hotel’s general manager to inquire whether any of the current staff had been employed during the years when Jim Thompson lived there. I received an immediate reply from Ankana, who now held the title of Manager of Customer Relations. She had been hired by the Oriental in her teens—she was vague as to the exact age—immediately after World War II. In the subsequent half century she had come to dominate the place. Everyone in Bangkok, and most of the Oriental’s long-term guests, knew Ankana by name. She fed me chocolate gateau and laughed her silvery laugh and entertained me with stories of life in Bangkok when she was girl. She spent nearly two hours in my company, and she told me absolutely nothing I needed to know. When I asked her gently what she thought had happened to Jim Thompson, she gazed at me limpidly and turned the question on its head. I told her that I thought Thompson had never ceased working as a spy, and that when he journeyed to Malaysia on that final weekend of his life, he intended to meet someone—an agent, a contact, perhaps his killer—in the jungle of the Cameron Highlands. I said I believed that he possessed a vital piece of information the Thai government wanted suppressed: the identity of the regicide who had shot the young king of Thailand, Rama the Eighth, on June 9, 1946—paving the way for an authoritarian coup. I added that I thought Thompson had threatened to reveal the details of that old tragedy, and had been silenced as a result. Ankana lifted her hands and smiled. “Perhaps, after all, he was eaten by a tiger,” she said. The idea that Jim Thompson took a walk in a dangerous part of the Cameron Highlands and met his death by accident has long been bruited among the people who care about his story. Maybe, they say, he was hit by a truck—one of those crazed Malaysian long distance drivers pumped on amphetamines—and buried hastily in a shallow grave. Maybe he fell into a pit dug by one of the pygmy tribes that still lived in that part of the Highlands. Maybe, just maybe, he ran afoul of a tiger. “But nobody found the kill,” Harold Stephens pointed out. He was a largish man dressed in the Big Game Hunter style of Hemingway, thrust uncomfortably into a rattan chair. His hair and mustache were gray. As a cub reporter for the Bangkok Post years before, he had flown to the Cameron Highlands to join the search for Jim Thompson. I tried to explain to him that I didn’t need to solve Jim Thompson’s mystery. I merely loved the tale. It rings with the brittle clarities of Greek tragedy. A good man, the emblem of his century and class, loses himself in the jungle of American foreign policy, destroyed by the very qualities that once made him great. It was the story I wanted to use. In my book, The Secret Agent, I call Jim Thompson by an entirely different name. We left Thailand for Vietnam. After a few days in Hanoi, where the grimness of the wartime prisons vied with the beauty of the wide French boulevards, we descended upon Hue. The typhoon, unpredicted by science, preceded us and forced our plane’s diversion to the heart of the former DMZ, the town of Da Nang. For three hours we fought our way over the Hai Van pass, and by dawn the Perfume River had jumped its banks. Our hotel dining room was submerged a few minutes after we fled the breakfast table. Stranded in the same hotel were a delegation of Thai government officials and their press corps. Among the journalists was a familiar face: Harold Stephens. During the five days of our abandonment, unable even to phone home, we spent a lot of time with Steve, as he came to be known. Despite his instinct for reticence, we negotiated a truce: I posed hypotheses regarding Thompson’s fate, and Steve confirmed or denied them. He dropped hints like raveled stitches, and I knit them up again. Eventually we owed our escape from Hue—on a Royal Thai Air Force C-130 flown in from Bangkok—to Steve’s influence. When the Thai delegation left, they took eight Westerners with them, and Mark and I got two of the seats. No one can confirm what happened to Jim Thompson that Sunday afternoon in March of 1967. But from the stuff of rumor and potential libel it is possible to fashion a few theories, and a good deal of fiction. Thompson had amassed a priceless collection of Southeast Asian art he intended to leave to his family back in the States. The Thai government wanted to appropriate everything. Obstinate and enraged, Thompson attempted to negotiate in the Thai style: he threatened to reveal all he knew about the assassination of Rama the Eighth unless he and his collections were left in peace. He gambled with the Thai government, and he lost. And then there’s the matter of American choppers landing in the Highlands, and the body that was never found. Caught in a ring of fire in Southeast Asia, battling conflicts on every side, the United States needed Thailand in its corner. Who knows exactly what the army might have done in return for Thai gratitude? Six months after Thompson’s death, his sister was murdered in her home outside Chicago during a bungled burglary. According to Chase McQuade, Thompson’s great-nephew, the family believes she died during a botched attempt to locate Thompson’s last will, which bequeathed his estate to his extended family. In the end, however, the Thai government seized his art collection. The house on the khlong is now a museum—one of the most beautiful sites a traveler may visit in Bangkok today. Thompson’s books still sit on his bedside table, just as he left them on Good Friday 1967.